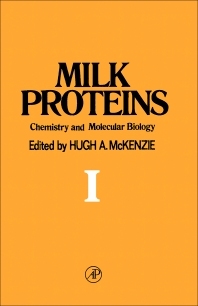 Milk Proteins: Chemistry and Molecular Biology, Volume I discusses the structure of evolution and biological function of milk proteins and enzymes. The milk proteins arise from a specific mammalian adaptation, and their study is important in its own right. However, the properties of milk proteins are such that their study has attained considerable importance in protein chemistry. In order to have a proper appreciation of the properties of milk proteins, this volume provides a general perspective and strategy for their study. This book is divided into three parts. Part A focuses on the historical survey of milk proteins, its comparative examination and characterization, and study of its immunological and allergenic reactions. Parts B and C discuss the basis of chemical and physical approaches most appropriate to the investigation of milk proteins. This publication is recommended to protein chemists and biochemists working in other areas. It will also serve as a good reference for advanced undergraduate and graduate students of milk protein chemistry.